Like the rest of Thailand, Trat is subject to the annual monsoon rains, which are heaviest from June to September. 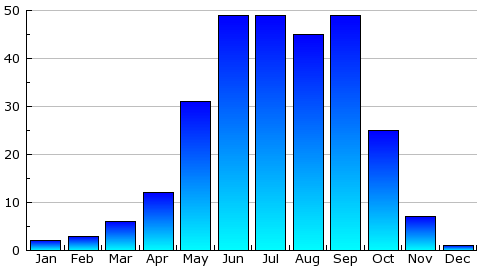 The coolest and driest time of year is December to February. While I generally emphasize that the rainy season is not an entirely bad time to visit Thailand, it really isn't a good time to visit Trat. There is very little to do away from the beaches, since there are no historical or cultural attractions in the area. Even the shopping isn't all that good. See the banner below for current conditions.